Happy reading and good listening on C.J.Q.S. 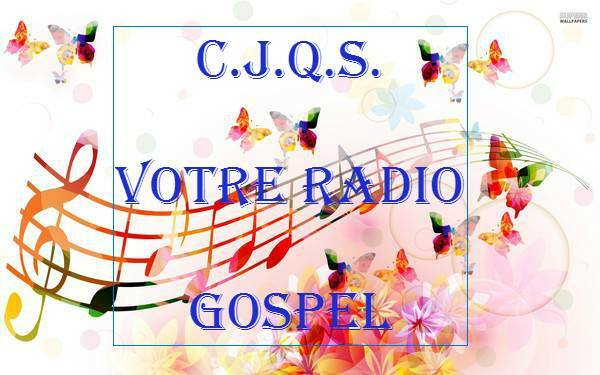 Your Gospel Radio at: http://cjqsradio.blogspot.fr/p/radio.html and remember the show Gospel Force to 16 hours in Quebec, + 6 am in Europe or + 7 am in Africa. In this program you will hear beautiful pieces chosen English and French. Be blessed. Come. After the multiplication of the loaves, Jesus commands his disciples to board a boat and go to the other side of Lake Galilee, as he returns the crowd. Then he goes to a place to pray removed. During the trip, a storm comes up. It's night. Between three and six o'clock in the morning, Jesus came to them, walking on the water. He said, "Courage, it is I, fear not." Peter, who recognized the voice of the Lord said to him in the power of his faith: "Lord, if it is You, command me to come to you on the waters." It is admirable audacity of the request of Peter and his amazing walking on water by faith! As he fixed his eyes on Jesus, he accomplished the impossible, the waves under his feet. But suddenly, he worries about the strength of the wind has not wavered and then it starts to sink. Why ? The Lord, who has seized his hand to prevent him from drowning, the diagnosis is in the form of a single question: "Man of little faith, why did you doubt?". Peter's faith, remarkable at first, suddenly faltered. Jesus, he hears the wind, saw the waves and crying for help. Fear has settled in his mind as fast as his energy drove him to ask Jesus to go to him. Since neither the circumstances nor the people had not changed, the lesson is clear: we produce our own fears, our doubts. Peter said in the midst of the storm, "Lord, if it is you, command me to come to you on the waters." Jesus got into the boat, the storm, the doubts disappear and all the disciples worship him: "Truly you are the Son of God!". What is the cure for a little faith? It is simply fix our eyes on Jesus, "the head of the faith and the one who leads to achievement" (Heb. 12 2). True faith begins and ends with our gaze fixed on its object: the Lord. Only this attitude will make it grow.